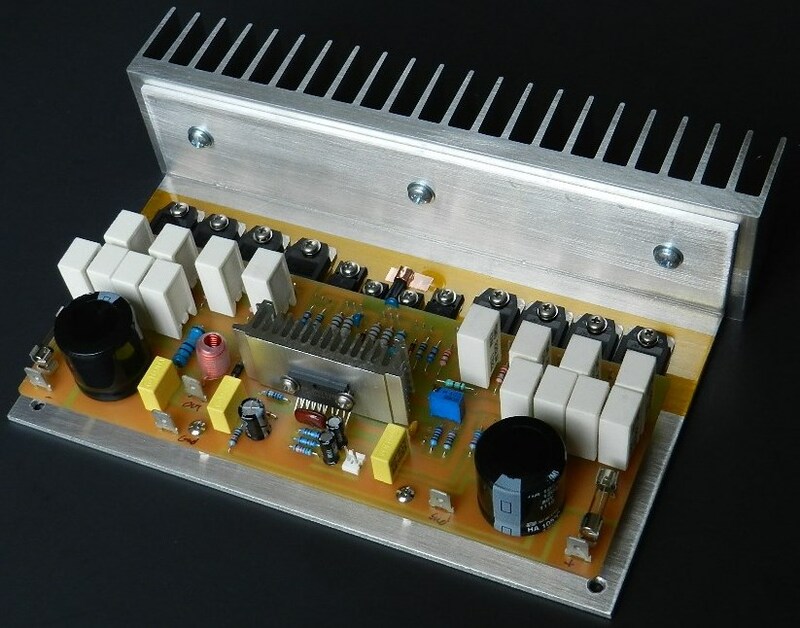 Project 20 is another audio power amplifier project that uses the LME49811 as the input stage combined with a triple compound topology output stage. The output stage is a cascaded arrangement of TO126 pre-drivers, TO220 drivers and TO3P power output devices. The input signals coming from pin 13 and 14 of LME49811 are connected to the first common-emitter pre-driver stages. These are followed by the second emitter-follower driver stages, which drive the paralleled common-emitter PNP as well as NPN power output stage transistors. The amplifier’s output is taken from the collectors of the power output transistors to deliver more current drive to the loudspeaker load. The output is also connected to the emitter of the first stage resulting in a unity-gain local feedback. Radial power resistors R1~R16, D3~D4, as well as C6~C7 are used to improve the overall stability of the amplifier. 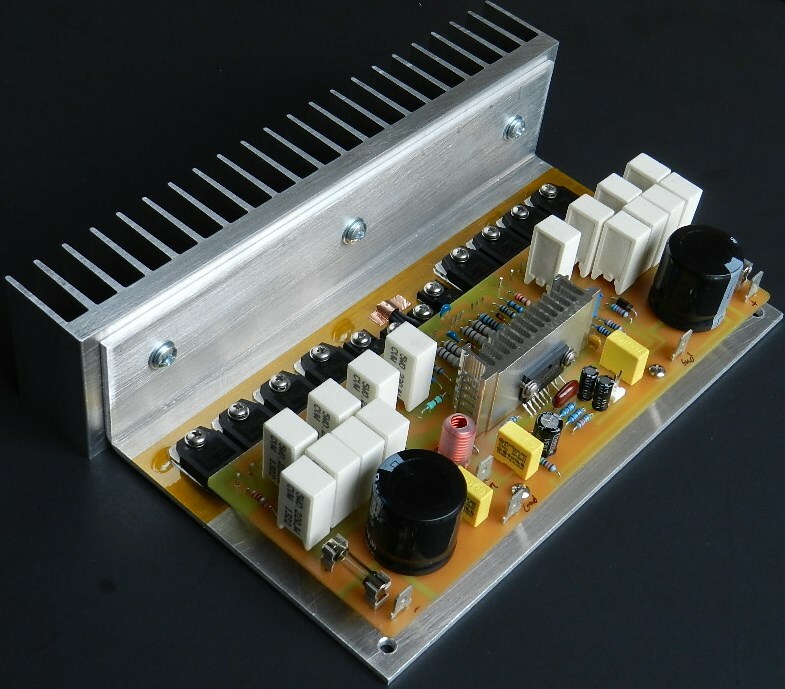 The power output of Project 20 is about 195Wrms into an 8Ω load with a ±64VDC power supply. The schematic diagrams, BOM and PCB layout for Project 20 are available for free by request, as is, no warranty. The 2 through-hole locations labeled (X) in the silkscreen layer of the PCB are for 2 equal lengths of 18AWG hook-up wires to connect one end of R5~R8 and R13~R16 together to L1, preferably soldered at the bottom of the PCB. Silkscreen and parts placement layer of PCB for Project 20. Here comes the fun part. Prepare 3 DMMs to measure the DC offset voltage, the voltage between collectors of PNP and NPN power output transistors and the idling current of the amplifier. Insert a jumper or shunt at the input of the amplifier. Do not connect any load or speaker at the output of the amplifier. Initially power the amplifier under test with ±24VDC. Adjust the Variac transformer to obtain ±24VDC from the power supply. The picture on the left is showing the DC offset voltage at about 2.2mV measured at the output of the amplifier, 10.1mV across the collectors of Q9 and Q13 and the idle current at about 99mA across the F+ fuse terminals. Adjust VR1 to obtain the 10mV reading after a warm-up period of about 10 minutes. Switch the power supply to OFF immediately if you get different DMM readings. Proceed with the rest of the test procedure if you've acquired the same DMM readings. Gradually adjust the Variac to obtain ±64VDC from the power supply while keeping watch on any sudden increase in the DMM readings. If you observed an increase in any DMM readings switch the power to OFF immediately and check for any PCB assembly errors. The picture on the right is showing the DC offset voltage at about 1.1mV, the voltage across Q9 and Q13 at 10.4mV and the idling current at about 105mA. Readjust VR1 after 30 minutes to get the same 10mV DMM reading, after that you may proceed with music test. Project 20 was auditioned with the LM1036 tone control project and it did not disappoint! 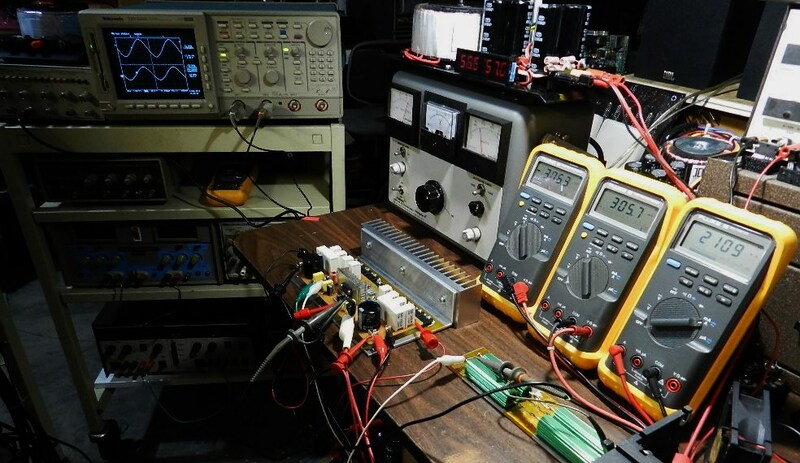 The next test procedure is optional, but if an oscilloscope, audio signal generator and 8Ω dummy load are available, you can measure the power output of the amplifier. Do not touch the heat sink or the dummy load during this test; they will get extremely hot! Notice the voltages of the power supply had dropped about 10% when the amplifier was applied with the maximum input signal to produce the power output before clipping occurs, as shown in the picture on the left. The power output was measured using an HP3312A Function Generator set at about 1KHz 2.64Vp-p sine wave output and connected directly to the input of the amplifier under test as well as CH1 test probe of the oscilloscope. 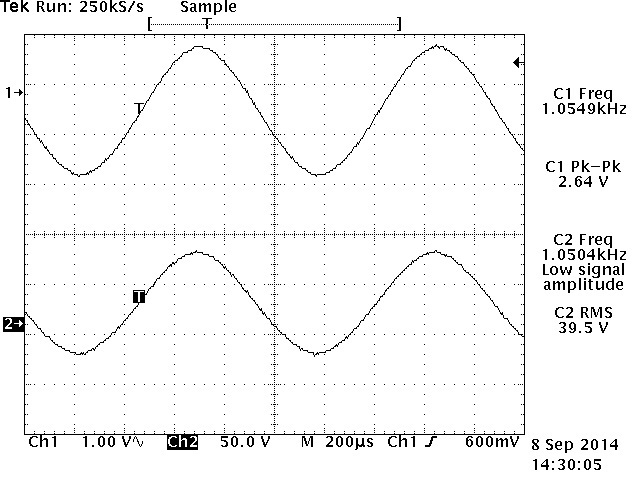 An 8Ω/400Watt dummy load was connected at the output of the amplifier under test as well as CH2 probe of the Tektronix TDS520D 500MHz DPO. The amplifier produces 39.5Vrms across the 8Ω/400W dummy load or a power output of about 195Wrms, as shown in the TEK hardcopy picture on the right. The oscilloscope’s horizontal scale was adjusted at 200uS to verify for any visible clipping on its peaks. Higher power output is attainable with a 4Ω load. Have fun!